The College of Engineering at UC Davis presented the Engineering Design Showcase on June 6, 2013 at The Pavilion on the university campus. Students shared their senior group projects, applying the knowledge and skills gained during their years of study at UC Davis. 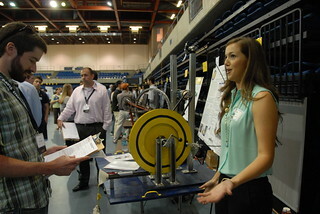 The 2013 Showcase featured more than 100 teams (400+ students), and included displays and prototypes of student engineering projects in such fields as aerospace, mechanical engineering, medical and veterinary technology, electronics, and chemical engineering.